I love community, as it has been my driving force for the past 10 years. Startup communities are always super interesting to me in that they have this rare combination of commerce, social impact, individual empowerment, and the complete absence of a gatekeeper. Both are noble but one is just exciting for me. 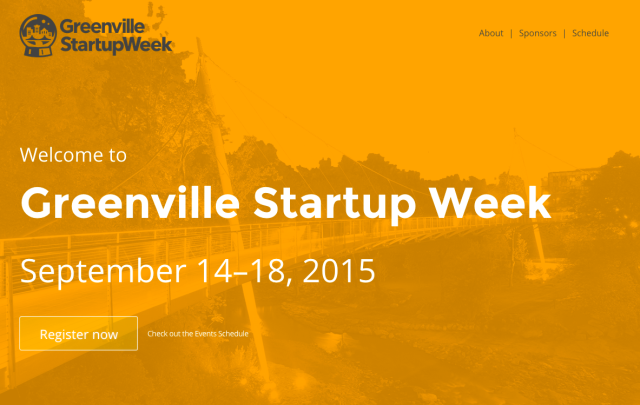 Greenville, North Carolina is having their first Startup Week this week. They have 22 events over five days celebrating everything about their community. What is a startup though? I’ve developed the thought that a startup is a project with passion. That is it. No mention of funding, technology or scalability. It is someone with a dream that puts it into action. It can be big or it can be small and either is totally fine. Greenville’s Startup Week features a talk amongst non-profits, a barista showing off their craft, a food truck rally, a night owl developer meetup, and a new to town lunch. Their full schedule is here but I’m just thrilled with their organizing team. We will check in next week to see how the week went and what they learned.